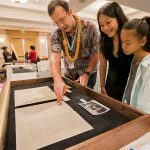 What should be in Hawaii’s new time capsule? 49 years ago, a time capsule was entombed at the state Capitol building. Today, it was opened. 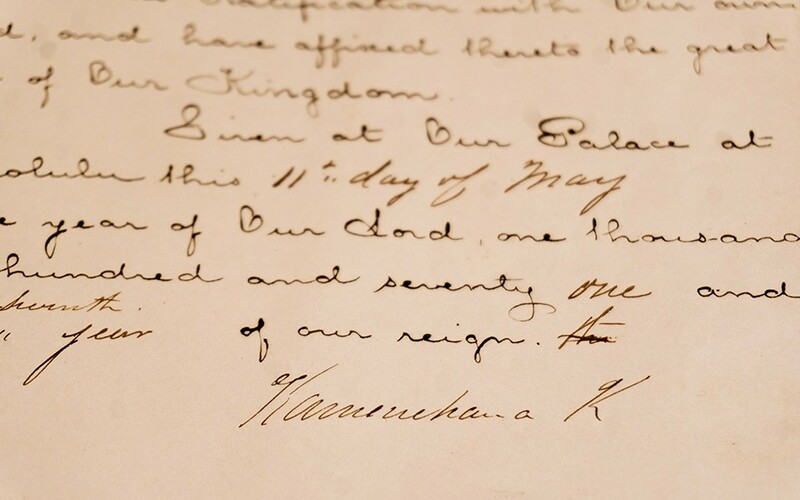 Kamehameha’s signature on the 1871 treaty of friendship and commerce between the kingdom of Hawaii and Japan. 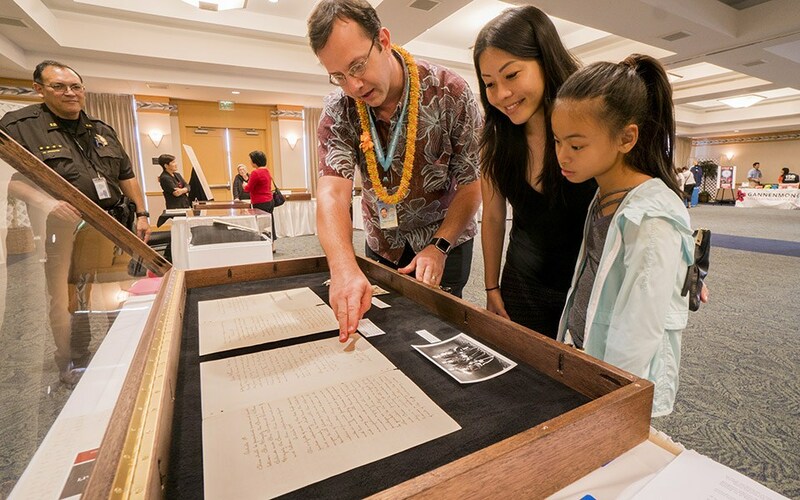 State archivist Adam Jansen, left, shows Trisha Nomura and her daughter, Jaysha, 10, the actual 1871 treaty of friendship and commerce between the kingdom of Hawaii and Japan. 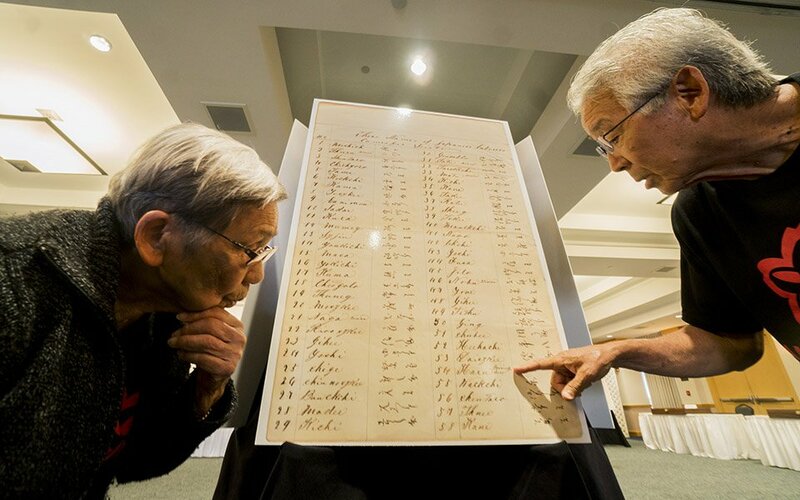 Jane Kurahara, left, and Les Goto examined an enlarged copy of the handwritten list of passengers who were aboard the ship Scioto at “The Gannenmono: Their Journey to Hawai’i,” a one-day exhibit held Tuesday of historical documents that chronicle the journey of the fi rst organized group of immigrants from Japan to Hawaii. Documents include the correspondence from Eugene Van Reed, consul general for Hawaii to Japan; the passenger list of the Scioto; the labor contract; and the treaty between the kingdom of Hawaii and Japan. The exhibit, which commemorates the 150th anniversary of the arrival of the Gannenmono in Honolulu Harbor on June 19, 1868, was presented in the Manoa Grand Ballroom of the Japanese Cultural Center. 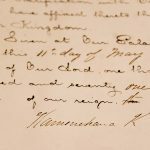 Documents and photographs from Hawaii State Archives were used during the research and publication of Lost Kingdom: Hawaii’s Last Queen, Sugar Kings and America’s First Imperial Adventure. Documents, newspapers, and photographs from the Hawaii State Archives Collections were used in this article. 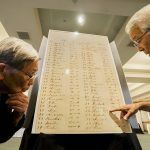 In an effort to put stories and faces to names, a database is being created by a nonprofit group in the hopes of educating people around the world about the hardships endured by people who were sent to Kalaupapa from the time it was established as a settlement for Hansen’s Disease patients in 1865. The database, which has about 5,000 names so far, is being assembled with Hawaii State Archives materials, including letters, settlement records and photos, and other resources. The names are also being gathered so they can be inscribed on a memorial to be erected in Kalaupapa. Scans of all four documents in our collection. The phone on which Elmer Cravalho as speaker of the Territorial House took the play-by-play call on the U.S. House vote 50 years ago. The phone and the picture of Elmer Cravalho are in the Hawai`i State Archives collections.